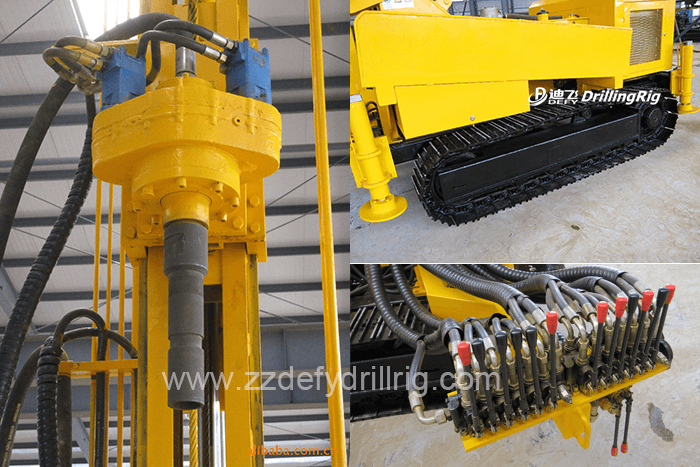 DF-300S Multifunctional water well drilling rig is a kind of high efficiency versatile full hydraulic crawler type drill rig. It has features like advanced structure, easy to use, safe and reliable. It can impact drill with compressed air or rotary drill with mud according to different geological conditions. 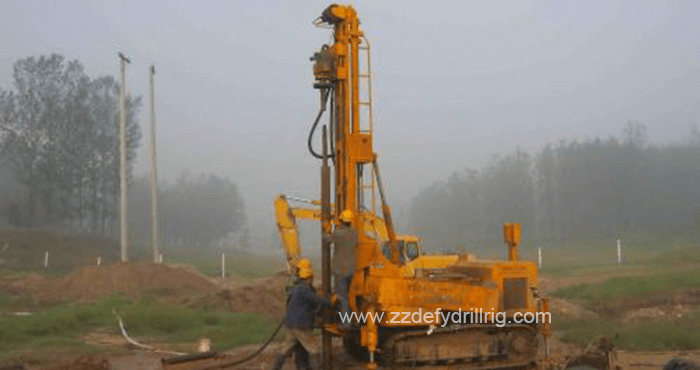 This drill rig is widely used in water wells, manholes, precipitation wells, geothermal air conditioning hole and other drilling exploration projects. It can also used for geo-technical engineering foundation reinforcement, pipe-following drilling for gravel and other loose stratums, hard stone borehole and other projects. 1. Power system is hydraulic system driven by diesel engine. 2. Equipped with different size DTH hammer and DTH bits according to caliber. Air compressor used for air supply and well flushing. 4. The motor is imported from USA with small size but large torque. Rotation speed can be adjusted according to different working condition to improve drilling speed. 5. Oil cylinder and steel wire rope structure used for lifting and lowering drill pipe. Safe and reliable. Axial pressure can be adjusted according to different working condition to improve drilling speed. 6. Unique double-acting tower design. Only 1 minute needed from drilling tower to main hoist. Two drill pipes can be added or released at each time. 7. Separate hydraulic oil cooler for hydraulic system to ensure continuous work outdoors in hot weather conditions.